Audio Clips: “Love Potion No. 9” (a 1992 film written and directed by Dale Launer), “Three Little Bops” (1957 Looney Tunes cartoon), The Honeymooners “Young Man With A Horn” (Episode 26), “The Chaser”, “A Passage For Trumpet”. Note: The episode was recorded a couple of days after musician David Bowie died, so I added a couple of tributes. The first was my rather horrid (mis)interpretation of “Changes” from the 1971 album “Hunky Dory” and the second tribute occurs after the end of the episode, a few seconds of the church bells at Dom Tower in Utrecht. The bells played “Space Oddity”. To mark the occasion of the one-year anniversary of my association with Mark Jeacoma and his wonderful VHS Rewind! 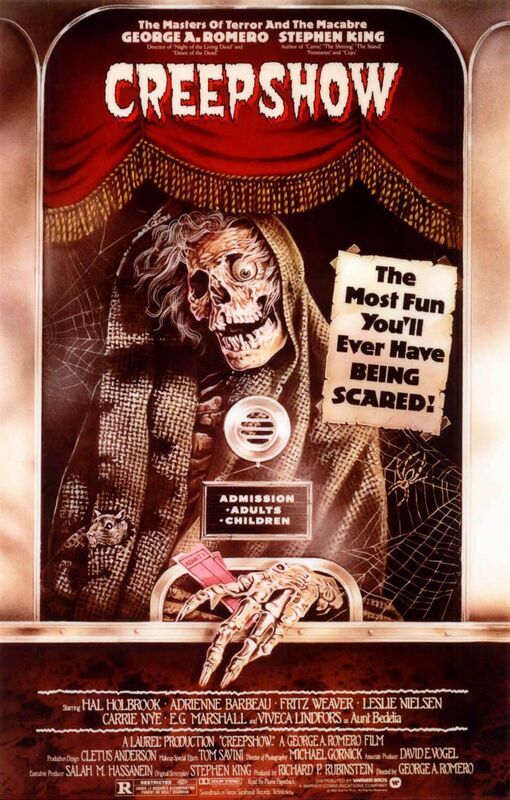 podcast and blog, I am adding a previous review I wrote for the 1982 horror anthology, Creepshow, and adapting it for this Vintage Cable Box review. This was a movie I absolutely fell in love with when I first saw it on cable television in 1984. Creepshow, 1982 (Leslie Nielsen), Warner Bros. It seems most movies these days are based around comic books and toys, but in 1982, the double-whammy collaboration of Stephen King and George A. Romero, produced the original comic-book adaptation, Creepshow, one of the great horror movies of the early 1980s. Inspired by Max Gaines and Educational Comics’ Tales From the Crypt, The Vault of Horror and later, Mad Magazine, Creepshow gives us five fun stories loaded with graphic violence and intended for adults only. George A. Romero, best known for Night of the Living Dead, the grandfather of the modern zombie movie, had directed cult favorites, The Crazies, Martin, and Knightriders. King, reportedly a fan of Romero’s work, suggested they collaborate on The Stand and wrote Creepshow as a sample screenplay to see if the two could successfully work together. This was due to the disappointment he felt from Stanley Kubrick’s adaptation of King’s The Shining. Creepshow is an anthology of five stories about familial revenge, hapless hillbillies, a Tasmanian devil in a crate, the consequences of infidelity, and cockroaches (lots of freaking cockroaches!). What really propels the stories is a wicked sense of humor, dark comedy, and lots of gore. A great cast (Ted Danson and Ed Harris in early roles, Leslie Nielsen in one of his last dramatic roles, Hal Holbrook, Adrienne Barbeau, Fritz Weaver, and E.G. Marshall) round out the carnage, and though the film only earned modest receipts at the box office, it did very well in pay TV and home video markets. 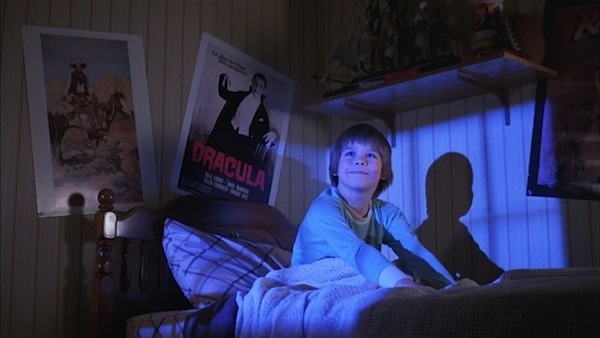 Romero’s lighting, use of shadow and bold primary color along with the continuity device of using comic book cells and the framing story of an abusive father and his sociopath son (played by Stephen King’s son, Joe) deconstruct the horror genre and places it in a post-modern context, much like Romero would do with Day of the Dead, the underrated Monkey Shines, and Tales From The Darkside (an anthology television series based, in part, on Creepshow). Creepshow was followed by two lackluster sequels, Creepshow 2 in 1987 (based on stories, not a script by King), and the “unofficial” no-budget Creepshow 3 in 2007. Romero would later work with Stephen King for The Dark Half in 1993, but that film was shelved for two years due to Orion’s impending bankruptcy. The entry was written prior to the beginning of my Vintage Cable Box articles to tie-in with the release of a VHS Rewind podcast with Mark Jeacoma and Chris Hasler that has still not seen the light of day. I volunteered to edit the episode, and I am grateful to Mark for giving me the opportunity, but I think I cut too deep, removing a lot of the spontaneity that is a hallmark of that fine podcast. Cable television was a treasure trove of great horror movies in 1984. You had the old (Psycho, The Birds) and the new (Creepshow, Friday the 13th), something borrowed (Dressed To Kill), and something blue (Jaws 3D – because the water is blue, you see … ahem, moving on!). Occasionally, it can be a crap shoot. 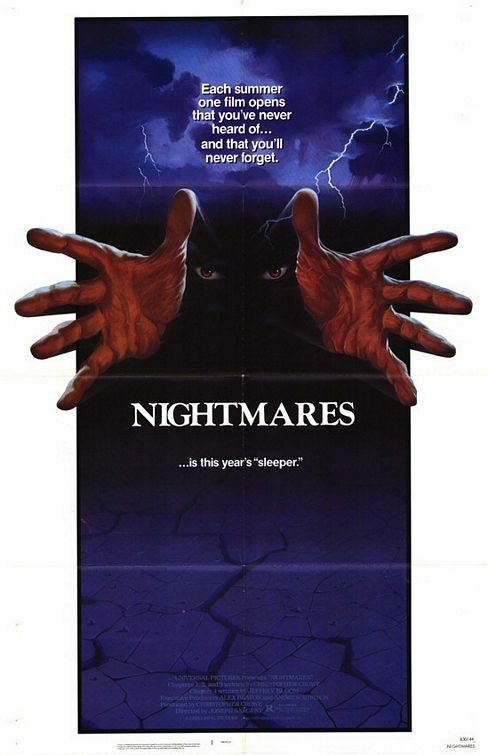 You’ll find a gem like The Sender, but then a movie like Nightmares will come on, and then you’ll shy away from anything else The Movie Channel has to offer, but don’t let that deter you. It was the mini-festivals and tributes to certain filmmakers that appealed to me and inspired me to make my own movies. Chain-smoking Cristina Raines runs out of cigarettes. I know how she feels. A chronic life-long smoker myself, I’ll actually leave the comparative safety of my home in the middle of the night, go up a block to the corner Rite-Aid, present my I.D. and get a pack of smokes. I can’t handle being without cigarettes. I’m aware of my problem and I know it’s wrong to smoke and bad for my health, so please, no judgments. Back to the story. An escaped mental asylum inmate wreaks havoc in the Canyon. Doesn’t anybody know not to live in California? It’s nothing but trouble. Against her non-smoker husband’s wishes, she drives off into the night looking for smokes. Bad move. This episode is based on an old urban legend, which I won’t spoil for anybody who hasn’t seen the movie. Suffice to say, it’s good scary fun. Emilio Estevez is a strutting video game hustler who listens to Fear’s “I Don’t Care About You” (a favorite of mine) on his vintage walkman. His game is something called Pleiades, an 8-bit Space Invaders/Galaxian knock-off, but his true passion is The Bishop, a three-dimensional maze shooter game, which he plays with aplomb, but he can never seem to get to level 13. His obsession with The Bishop gets him grounded, but he sneaks out and keeps playing the game. When he makes it to level 13, the arcade video game explodes and all of the silly, pre-X-Box avatars and sprites come to life and Emilio must fight them for real. This is a silly Tron-style Twilight Zone rip-off that is only interesting because of it’s dated appeal. Kids today! Lance Henriksen’s world-weary, alcoholic priest takes to the open road in a 1970 Chevelle after suffering intense nightmares, and the recent death of a child. He is soon menaced by a demonic pickup truck from Hell, with an upside-down crucifix hanging from the rear-view mirror. The symbolism of a demonic truck chasing an ambivalent priest is tantalizing, but the execution of the story feels like a muddled contrivance that recalls William Friedkin’s The Exorcist and Steven Spielberg’s Duel. Though, refreshingly, there is no explanation for why this is occurring, it isn’t enough to keep me interested despite Henriksen’s performance (easily the best in the entire film). After a Poltergeist-like battle with kitchen cabinets and cans of food, shrill housewife Veronica Cartwright implores nebbishy, cheap husband Richard Masur to get an exterminator. The episode is called “Night of the Rat” so you can pretty much guess what it’s about. I can’t think of a more annoying couple than Cartwright and Masur, and here we have to spend a half an hour with them! The beast kills Rosie, the family cat. An old exterminator tells tales of a devil rodent that terrorizes the wicked, or something like that. This episode reminds me of Hammer’s House of Horrors, but the idea of a family being tortured by a giant rat makes me laugh, and then once you see the thing, it’s hard not to bust a gut! Oh, and evidently, it can communicate telepathically with children. God bless us, everyone! More proof of the dangers of smoking! Nightmares was an obvious cash-grab after the unexpected success of Creepshow the previous year, but the movie didn’t start out that way. The episodes were originally shot as part of an anthology genre series for television (similar to Rod Serling’s Night Gallery) titled Darkroom, but were deemed “too intense” and graphic for regular viewing. When Darkroom was cancelled, these episodes were edited together into a feature film with added scenes of violence and language. The results are mixed, and unlike Creepshow, there is no thread or host segments to connect the stories. “Terror In Topanga” and “The Benediction” are the best episodes from this misguided anthology. 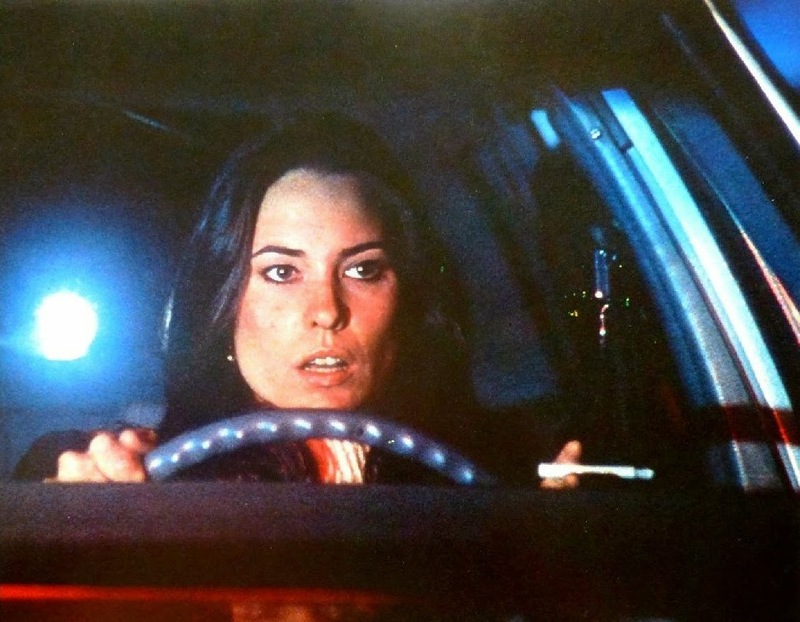 Cristina Raines was seen in Michael Winner’s goofy but fun 1976 Ira Levin rip-off, The Sentinel. Emilio Estevez was one of the founding members of the Brat Pack with The Breakfast Club and (ugh!) St. Elmo’s Fire. Lance Henriksen was in Near Dark and the TV series, Millenium. Veronica Cartwright appeared in Philip Kaufman’s remake of Invasion of the Body Snatchers, and Richard Masur appeared in John Carpenter’s remake of The Thing. I don’t know what happened to the giant rat. It probably went out for a pack of smokes. Next up: Halloween III: Season Of The Witch from 1983.